Is Crude Oil a “Bubble” Ready to Burst? “A trend in motion, will stay in motion, until some outside force, knocks it off its course!” After watching the parabolic rise in crude oil prices, doubling from a year ago, to above $130 a barrel last week, central bankers who under-estimated the power and resiliency of the “crude oil vigilantes”, are now praying for a “Bubble” that is destined to burst under its own weight, and at a moment’s notice. In an interview with The Daily Telegraph, one of the world’s biggest hedge fund traders, Mr George Soros said although the weak US dollar, depleting supplies from ageing oil fields, government fuel subsidies, and record Chinese and Indian demand could explain the parabolic surge in energy prices, the crude oil market is also significantly inflated by speculation. “Speculation is increasingly affecting the price, which has a parabolic shape, which is characteristic of bubbles,” he said. It’s dangerous to pick a top in a raging bull market, since bubbles can inflate more than anybody could have imagined. On May 20th, T-Boone Pickens told CNBC he expected crude oil prices to keeping going up. “I think we’ll get to $150 this year,” he reckoned. The next day, soon to be deposed Israeli PM Ehud Olmert called for a US naval blockade of Iran, and if that happens, crude oil could hit $200 /barrel. Who is Inflating the Bubble in the Global Oil market? The Federal Reserve is the chief culprit, by slashing the fed funds rate 325-basis points to a negative -2%, after adjusting for inflation, and expanding the US-M3 money supply by 16.5% from a year ago, in a desperate effort to stop the slide in the sinking US banking sector. By slashing interest rates deep into negative territory, the Fed encourages speculation in commodities by pushing down the dollar, which in turn, is pushing up the price of dollar-denominated commodities, such as crude oil and gold. So far, the Fed’s aggressive rate cuts haven’t found any meaningful traction in the S&P Banking Index, which is still languishing at the March lows, and -40% lower from a year ago, with banks posting hundreds of billions in losses from toxic sub-prime mortgage debt. The Fed’s single focus on rescuing the banking sector, with no regard for the inflationary consequences of its actions, has led to the emergence of the “crude oil vigilantes” who punish central bankers with sharply higher oil prices, whenever they become too abusive with the money supply. In the past, a sharp slowdown in the US economy, the world’s biggest oil guzzler, usually pushed the price of crude oil and other commodities lower. But the Fed was caught by complete surprise, after crude oil prices doubled, even as America’s economy slipped into a recession in the first quarter. “The current oil price has no relation to market fundamentals,” explained Saudi oil chief Ali al-Naimi on March 5th. “It is linked to tremendous speculation in crude oil futures. There are even those who buy futures and speculate that oil prices will reach $200 in 2013,” he said. On April 28th, OPEC chief Chakib Khelil observed that crude oil prices were climbing, “even though supply is adequate, because the market is driven by the dollar’s slide. 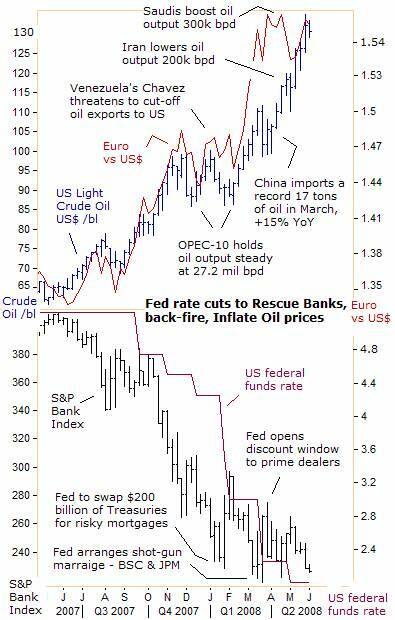 Each time the dollar falls 1%, the price of the barrel rises by $4, and of course vice versa. If for instance, the US dollar would strengthen by 10%, it is probable that oil prices will fall by 40%,” he figured. But such simple logic has its limitations. China, India, Russia and the Middle East combined, are now consuming more crude oil than the US, burning 20.7 million barrels a day, up 4% from a year ago, according to the IEA. The emerging economies are picking-up the slack in the oil market, more than offsetting a -1.3% contraction in US oil demand to 20.3 million barrels this year.Thus, a mild recession in the Western economies and Japan might not weaken global demand for oil. Economies of big oil-exporters in Russia, Mexico, and OPEC itself are growing so fast that their need for energy within their own borders will limit how much they can sell abroad. Internal oil demand in Saudi Arabia, Russia, Norway, Iran and the United Arab Emirates, grew 6% last year, and their exports declined 3 percent. Mexico’s oil output fell -9% in the first four months of 2008, from the same period a year earlier. If these trends continue, global crude exports could fall by 2.5 million barrels a day by the end of 2010, adding new strains to the global oil market. If crude oil speculators on the Nymex were buying “black gold” as a hedge against the US dollar’s slide against the Euro, the #2 reserve currency, then perhaps, traders in London were buying North Sea Brent as a hedge against the British pound’s devaluation against the Euro. The Bank of England engineered the British pound’s sharp devaluation against the Euro, by joining the Fed’s rate cutting spree last November, with three quarter-point rate cuts to 5 percent. The Euro soared 17% to 80-pence, while at the same time, North Sea Brent crude oil prices doubled to $130 /barrel. Flipped the other way round, the British pound buys around €1.25, down from €1.50 last summer, making European imports considerably more expensive. For Ivory-Tower economists, the Euro’s ascent against the British pound and US dollar, which closely tracked North Sea Brent was just a statistical coincidence. But for crude oil speculators, the sharp devaluations of the pound and US dollar translated into enormous windfall profits in their brokerage accounts. When riding the waves of a bubble, it’s always good to have the basic fundamentals are your side. Oil production is shrinking in 54 of the world’s top-60 oil producing nations, including Britain’s North Sea, where output peaked in 1999, and has already plunged by half. 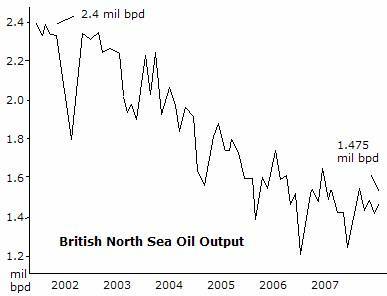 The UK began importing liquid gas, for the first time in history in July 2005, and its North Sea oil reserve is dwindling at an -8.5% annual rate. The curtain might fall on North Sea Brent by 2012, if enough isn’t done to maintain development and exploration, according to the UK Offshore Oil Industry. But political pressure on the BoE for more rate cuts could intensify, after British home prices dropped for the eighth straight month in May, down -2% from a year ago. The average selling time for UK homes has climbed to 9.8-weeks, compared to 5.8-weeks in May 2007. A further slide in home prices could topple the UK’s asset based economy into recession, and deepen losses for British banks. 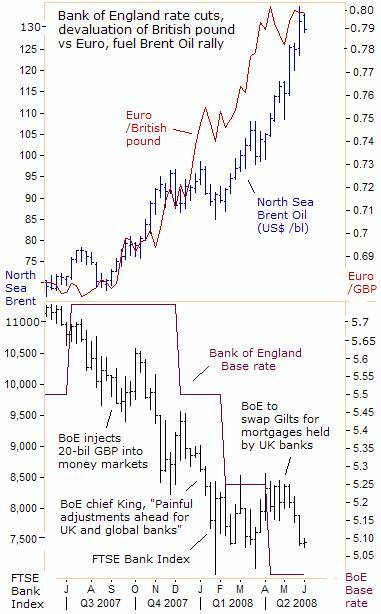 Another round of BoE rate cuts could renew selling pressure on sterling and buoy oil prices. Currency devaluations do not fully account for crude oil’s dramatic rise to as $135 /barrel last week. “Peak Oil” theorists have a better explanation, and Saudi Arabia’s threat to ramp-up oil production by 2012 is sounding hollow. However, currency swings do magnify the volatility and price trends in the crude oil market, the same way the “yen carry” trade magnifies swings in the global stock markets. No market travels in a straight line forever, and shakeouts in the crude oil market are designed to wipe-off the speculative froth. However, a British and US economic recession would not necessarily burst the oil bubble, if the net result is another sharp devaluation of the British pound and US dollar in the foreign exchange market, which would support high oil prices. The basic laws of supply-and-demand don’t work in an economy, where the government intervenes with price controls. In China, gasoline prices haven’t gone up since last November, even though crude oil prices have gone up 35% since then. Beijing controls gasoline prices to limit their effect on inflation, and prevents refiners from passing on higher oil import costs to consumers. Without the price controls on energy distillates, Chinese inflation would already be in the double-digits. China Petroleum & Chemical (or Sinopec: SNP.n), said its first-quarter net profit fell 69% from a year earlier due to surging crude oil costs. Sinopec imports about 80% of its total oil needs, and its refineries break even if oil import prices are $76 a barrel or lower. To cover its losses, SNP received a government subsidy 4.9 billion yuan in the fourth quarter and 7.4 billion yuan for the first quarter of this year. So at a time when global oil giants are reporting record profits, Chinese oil companies are suffering heavy losses, because of government controls that have frozen retail gasoline and diesel prices, while refiners must pay rising market prices for crude oil. Petro-China PTR.n, China’s biggest oil company, and the most heavily weighted stock in Shanghai, said its first quarter profit plunged 31.5 percent. Last week, a rumor was floated that Beijing would allow higher prices for gasoline and diesel supplies, and Sinopec quickly surged 10%, the daily limit, and PetroChina jumped 7% to 17.86 yuan. But the rallies fizzled out, after Beijing squashed the speculation. Beijing controls $1.75 trillion in foreign exchange reserves, and can easily subsidize fuel at artificially low prices for many years to come, which means Chinese demand for oil can continue to increase by 500,000 barrels per year. India is Asia’s third-biggest oil consumer, and imports 70% of its petroleum needs. Although crude oil has doubled from a year ago, and the Indian rupee has lost 5.5% against the dollar this year, New Delhi has only permitted just one increase in retail fuel prices in 20-months. India’s widely-tracked wholesale price index was 7.82% higher in May from a year ago, the highest in 3-½ years, and would be in double-digit territory without the price controls on fuel. India’s big-3 oil refiners Indian-Oil, Hindustan Petroleum and Bharat Petroleum, have borne the brunt of the crude oil spiral, are expected to report combined losses of 1.8 trillion rupees for the past year, from selling fuel below cost. Oil companies, which bear the brunt of the price-control mechanism, are compensated partially through subsidies from upstream companies and oil bonds from the government. India’s Petroleum ministry is pitching for a reduction in the taxes and duties that account for about 55% the retail price of petrol. But the government earned a whopping 71,000 billion rupees in 2006-07 from taxes and duties on petroleum products last year. Thus, the Finance ministry might object to a reduction in petrol taxes, which constitute such a big chunk of the government’s revenues. The Indian central bank prints rupees in exchange for US dollars that it buys on the foreign exchange market, and has built-up a sizeable stash of FX reserves totaling $315 billion. 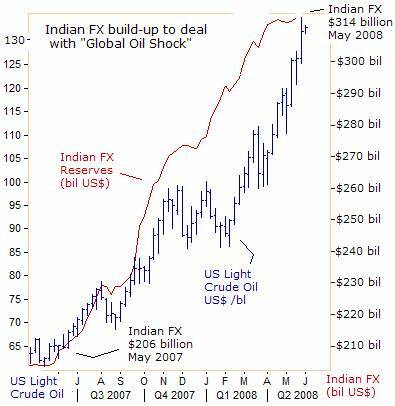 The massive build-up of FX reserves can help India to cope with major external shocks, such as the surge in oil prices. In the past sixteen months, India’s imported 121 million tons of crude oil crude oil, up 9% from the same period a year earlier, and its oil import bill jumped 40% to $68 billion. The Bank of India bought $17.5 billion since the start of 2008 to keep the rupee from gaining against the dollar, which is inflating the Indian M3 money supply at a +22% annualized rate, and combined with soaring food and energy prices, threatens to ravage its economy with hyper-inflation and social unrest. India’s central bank is relying on cash management tools rather than interest rates to fight inflation, lifting the bank’s reserve ratio to 8.25%, its highest in seven-years, to drain liquidity. What could possibly knock the mighty crude oil market off its upward course? A coordinated round of interest rate hikes by the world’s top-20 central banks. 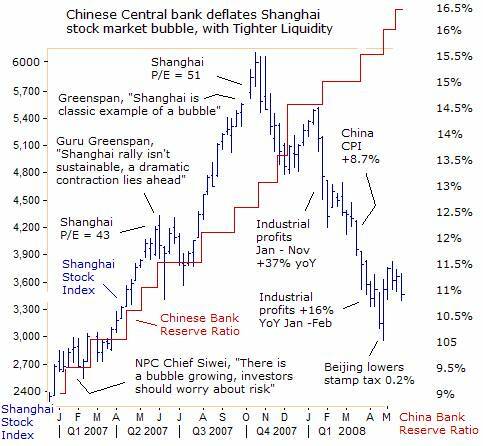 Consider the Shanghai red-chip market, one of the four biggest bubbles in stock market history, which increased five-fold in less than two-years to a record 6,120 last October, before it deflated by 50% over the next seven months. Shanghai lost half its value, because the People’s Bank of China (PBoC) pursued a carefully calibrated tightening campaign that drained trillions of yuan out of the local money markets. The Chinese central bank “pricked the bubble” in the Shanghai stock market, when it hiked bank reserve requirements by 1% on Dec 8th to 14.5%, which in turn, knocked the red-chip index below the psychological 5,000 level. But the PBoC didn’t stop its tightening campaign at 14.5%. Instead, it continued to hike the level of cash that Chinese banks must hold in reserve to as high as 16.5%, and thus, dealt a punishing blow to over-zealous speculators in the market. The PBoC can afford to tighten its money policy, because unlike Western nations, its banking system isn’t infected with toxic US sub-prime mortgage debt. The PBoC tightened liquidity, with the permission of the central government party bosses, even at the cost of knocking the Shanghai stock market lower, in order to contain inflation pressures. Yet despite the PBOc’s tightening campaign, China’s M2 money supply is still 18% higher from a year ago and combined with soaring commodity prices, is fueling a +8.5% inflation rate, the highest in 12-years. One-year Chinese bank deposits are only yielding 4.25%, far below the inflation rate, and preventing the PBoC from getting ahead of the inflation curve. Controlling inflation is still the priority for China’s leaders, and the yuan exchange rate has become a major weapon. A stronger yuan would ease inflation pressures by lowering the cost of commodity and oil imports. “We will strengthen the flexibility of the yuan’s exchange rate and utilize its role in optimizing resources to hold back rising prices,” the state media reported last week. The Chinese yuan rose to 14.4 US-cents this week, up +10.5% from a year ago, but the rate of appreciation was far less than the doubling of world oil prices. Beijing slows the rate of yuan appreciation thru intervention in the foreign exchange market. The downside to intervention is that it increases the supply of yuan in the economy, which fuels inflation. To prevent that from happening, the PBoC sells government bills and bonds to remove the excess yuan from the economy. But this type of operation is costly, because the government must pay interest on the debt from its FX reserves. The PBoC pays 2% more on its six-month bills than it earns on similar-maturity Treasuries held in its $1.75 trillion of FX reserves. The PBoC is now losing $4 billion a month by intervening, which doesn’t include the costs of subsidizing record high oil prices. 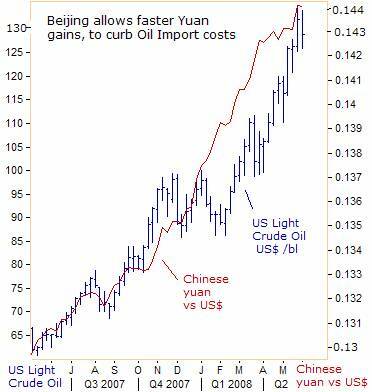 The costs are becoming a big burden, and the ultimate end-game is less intervention and faster yuan gains. 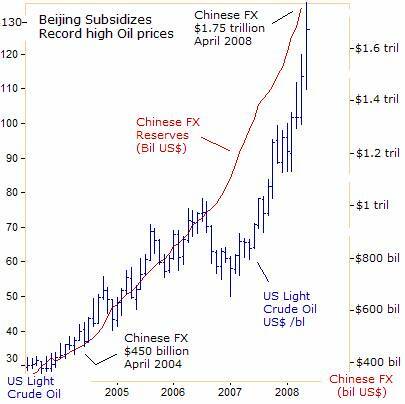 But since crude oil is denominated in US dollars, it’s the Bernanke Fed, which has the “magic wand” that can deflate the bubble in the crude oil market, by using the same tactic deployed by the PBoC, - tightening the Fed’s monetary policy, in order to strengthen the US dollar in the foreign exchange market. But does anyone believe President Bush would give the Bernanke Fed the “green light” to lift interest rates ahead of an election, when US home prices are tumbling? On May 15th, the most radical inflationist appointed by Bush to the Fed, Frederic Mishkin argued that, actions such as attempting to prick a price bubble with interest rates should be avoided. “Just as doctors take the Hippocratic Oath to do no harm, central banks should recognize that trying to prick asset price bubbles using monetary policy is likely to do more harm than good. Interest rates are too blunt an instrument for targeting sharp rises in specific asset prices,” Mishkin said. In the UK, the soaring food and energy costs are squeezing hard-pressed consumers more than ever. The government’s inflation rate jumped to 3% in April, driven by higher food +7% and fuel +9%. But the average British house is expected to sink by 14% or 26,000 pounds in the next 12-months, after falling 5% since the market peaked in August. Would the Bank of England to hike its base rate to strengthen the pound and combat high oil prices, when home prices are tumbling? This article is just the Tip-of-the-Iceberg, of what’s available in the Global Money Trends newsletter, for insightful analysis and predictions of (1) top stock markets around the world, (2) Commodities such as crude oil, copper, gold, silver, and grains, (3) Foreign currencies (4) Libor interest rates and global bond markets (5) Central banker "Jawboning" and Intervention techniques that move markets. Disclaimer: SirChartsAlot.com’s analysis and insights are based upon data gathered by it from various sources believed to be reliable, complete and accurate. However, no guarantee is made by SirChartsAlot.com as to the reliability, completeness and accuracy of the data so analyzed. SirChartsAlot.com is in the business of gathering information, analyzing it and disseminating the analysis for informational and educational purposes only. SirChartsAlot.com attempts to analyze trends, not make recommendations. All statements and expressions are the opinion of SirChartsAlot.com and are not meant to be investment advice or solicitation or recommendation to establish market positions. Our opinions are subject to change without notice. SirChartsAlot.com strongly advises readers to conduct thorough research relevant to decisions and verify facts from various independent sources. Copyright © 2005-2008 SirChartsAlot, Inc. All rights reserved.